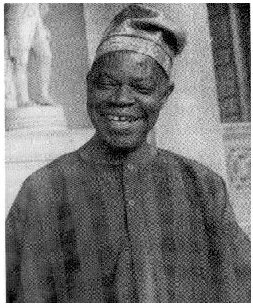 Amos Tutuola 1920-1997, Tutuola completed his first full-length book, The Palm-Wine Drinkard, within a few days. After he had written his first three books and become internationally famous, he joined the Nigerian Broadcasting Corporation in 1956 as a storekeeper in Ibadan, Western Nigeria. Tutuola became also one of the founders of Mbari Club, the writers’ and publishers’ organization. In 1979, he held a visiting research fellowship at the University of Ife (now Obafemi Awolowo University) at Ile-Ife, Nigeria, and in 1983 he was an associate of the International Writing Program at the University of Iowa. In retirement he divided his time between residences at Ibadan and Ago-Odo. Tutuola died at age 77 on June 8, 1997 from hypertension and diabetes. First page of Amos Tutuola’s original manuscript for The Palm-Wine Drinkard.